PHILADELPHIA -- All the Philadelphia Eagles need to ensure they stay home in January is one more win. A victory over the Oakland Raiders (6-8) on Monday night secures the NFC's No. 1 seed for the Eagles (12-2) and gives coach Doug Pederson an opportunity to rest his starters in Week 17. First, they have to beat the Raiders. "If we're in that position, if we're fortunate enough to be in that position, to rest, I'll make a decision at that time," Pederson said. "But I think it's important here in these next couple of games that we continue to play. I think it's important to maintain the edge, maintain the aggressiveness. If it's one play, one series, one quarter, I'll make that decision at that time." Players and coaches will have an unusual game day because it's Christmas. Pederson is allowing the guys to spend the morning with their families before they report for work. "I think it's important that they spend time with their families Christmas morning, so I'm giving them an opportunity," Pederson said. "I pushed the schedule back just a little bit. We don't play obviously till 8. "Listen, you don't get these times back. You don't get them back. It's too important to me, my family. I want to make sure these players with young kids, coaches with young kids, they get a chance to spend Christmas morning together." Pederson, a former backup quarterback, is a players' coach. He gets it. So after the Eagles returned to practice after three consecutive road games, including a long trip to the West Coast, he cut back on their workload. The extra day to prepare for Oakland gave Pederson a chance to rest some banged-up players earlier in the week. 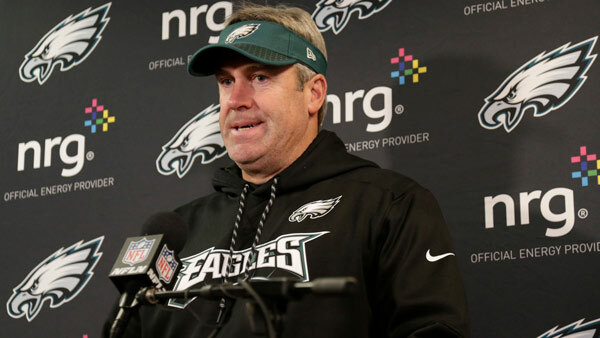 "I just make sure I communicate with the players and see how they feel, see where they're at, and then just monitor some of the GPS stuff that we're doing (with sports science), tracking data that's out there that we have and then just overall injuries, too," Pederson said. "The health of the football team overall. Listening to players and things of that nature, giving them that extra rest, staying off their feet, more up-tempo walkthrough practices this week. It's been good. Guys are feeling good. We've just got to keep guys fresh and healthy." Resting players is a priority because the Eagles have suffered a slew of injuries to key players. Carson Wentz was having an MVP-caliber season when he tore his ACL in Week 14. Nine-time Pro Bowl left tackle Jason Peters, middle linebacker Jordan Hicks, return specialist Darren Sproles and special teams ace Chris Maragos also have sustained season-ending injuries. Nick Foles makes his second start filling in for Wentz. He tossed four touchdown passes in a 34-29 win at the New York Giants last week and had an historic performance against the Raiders four years ago. Foles tied an NFL record with seven TD passes in Philadelphia's 49-20 win at Oakland on Nov. 3, 2013. His performance sparked an impressive turnaround and the Eagles went 7-1 in the second half after a 3-5 start to win the NFC East title in Chip Kelly's first season. Foles had 29 TD passes - including two in the playoffs - and only two picks that season. He was traded to St. Louis after the 2014 season, spent one year with the Rams, one season with the Chiefs and returned to Philadelphia to back up Wentz. Now, everyone is counting on Foles to deliver the first Super Bowl title in franchise history. "One of the great things, anybody that knows Nick, knows he's very, very comfortable in his own skin, and is very confident in his own abilities and is an excellent quarterback," offensive coordinator Frank Reich said. "And he exudes that confidence where the guys on this team see that, they feel that. You just know this guy's been successful. Just look at what he's done." The Raiders will likely be eliminated from the wild-card race before they take the field. It's been a disappointing season for Derek Carr and a team that entered with Super Bowl aspirations after going 12-4 in 2016. "I know there's things I can do better," Carr said .